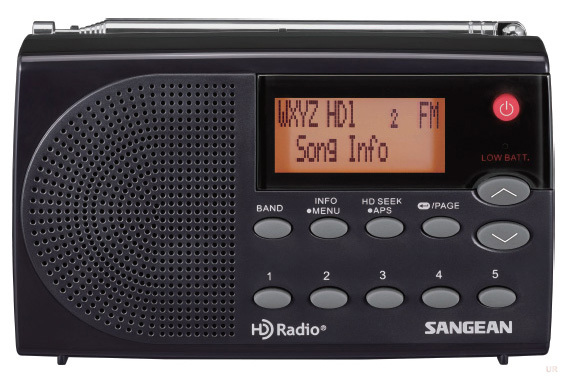 The Sangean HDR-14 is a portable radio capable of digital HD Radio™ AM and FM reception. HD Radio™ technology will produce dramatically improved fidelity and provide you with additional HD-only radio programming. Enjoy additional content, including sports, news and music without any subscription fees. * Headphone Output Jack (3.5 mm stereo). * Telescopic FM whip antenna and AM ferrite antenna. * Information display for: Channel Frequency, Call Sign, Radio Text, Audio Mode, Service Mode, Signal Quality and Clock Time. * Real time clock with dual Alarm and Sleep function. * Support for emergency alerts. The HDR-14 operates from three AA cells (not included) or via the supplied AC adapter. 5 x 3.02 x 1.28 inches. HD Radio technology manufactured under license from iBiquity Digital Corporation. U.S. and Foreign Patents. HD Radio™ and the HD, HD Radio and “Arc” logos are proprietary trademarks of iBiquity Digital Corp. Please also see the Sangean HDT-20 tuner and Sangean HDR-18 table radio.